For economic as well as ecological reasons, more and more re-cycled materials are incorporated in the production of window main profiles today. In some cases, these materials make up more than 40% of the total weight and are used wherever they are not visible. All visible surfaces are still made of virgin material. batten-feld-cincinnati has now designed the twinEX/conEX piggyback ex-truder combination precisely for such applications with a high pro-portion of regrind. 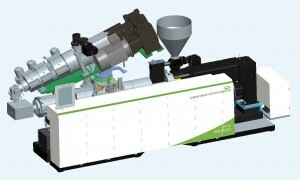 The two counter-rotating twin-screw extruders combined achieve an output of about 500 kg/h, with the parallel twinEX 78 being able to plasticize up to 290 kg/h, and the conical conEX 63 handling up to 220 kg/h.